There's this ongoing annual arty/ architecty event called Park(ing) Day that happens all over the country. This year it happened on Friday, September 18. In LA, it's taken the form of nonprofits setting up the usual temporary "park" in a parking space, feeding the meter and providing some diversion to passersby while simultaneously promoting their project. My amazing friend/collaborator Allison planned a park for City of Lights on Wilshire in MacArthur Park. We wanted to combine the public space statement that is a temporary park in the street with our ongoing efforts to publicize the bike movement to Latino cyclists in Central LA, so the activity Allison designed invited passersby to draw their ideal bike routes on maps of this part of town. We had a nice park set up, with five people sitting under a shade canopy, many LA-appropriate succulent plants in pots, and my little Vox amp blasting Café Tacuba, when a police car approached. It slowed, and a window came down. We chatted with them, explaining what we were up to in the parking space, that we'd fed the meter, and that they were welcome to stop and have some orange juice. They drove on, and I felt my adrenaline drain away slowly. I'd never heard of any Park(ing) Day parkers getting harrassed by cops, and assumed it was totally legal since it's such a popular, national event, so I figured that was the last of it. However, the same car circled the block, and pulled up behind us. This time the two officers got out of their car, and questioned our choice of parking space. We were set up on a curving part of Wilshire, the block that goes over the park on a bridge, and there were no other cars parked along our stretch. Right in front of us was a bus stop, and the signalized intersection of Park View and Wilshire after that. The officers were skeptical about our safety, since drivers routinely speed along that stretch of Wilshire. What if we had some traffic cones? No problem, I called Bobby, and he said he'd bring some from the ecovillage, where there's a bunch. This seemed to satisfy the police, who left to sit in their car. But no, they still didn't like the whole idea of the thing, so they called in back up. Then we had four officers, including Iris Santin, who has been building a reputation as a bicycle-friendly officer in that district, questioning our presence. We repeated over and over that this event happens all over the city, all over the country, for just a few hours one day a year. Among themselves the officers decided we needed to get out of the street. I called friends at another park, just a few miles west on Wilshire at Western, and they gave me the name of a police officer who had stopped at their park, seemed enthusiastic, and gave them a number to call him if they had any problems. They passed on that number to me, I called it, and reached a police department switchboard. I asked for the officer they'd named, but apparently the dude was on his day off. I explained the situation to the lady on the phone, who put me on hold and then let me know that they'd sent a superviser to our location. As I hung up the phone, I realized that the superviser was already there, bringing our total to five cops and three cars, agreeing that we needed to get out of the street. I entered the conversation, keeping my voice steady as I explained, again, that this event was happening all over the city with no problems; why should our park be an exception? I told them the name of the friendly officer who had visited Wilshire and Western, and they dismissed that with "he's off today." The superviser had a hard time understanding why we were in the street to begin with, confusing Park(ing) Day with bike lanes or something. At one point they claimed we should get out of the street because a pedestrian had been killed right near where we were set up the day before. During this conversation, a car pulled up next to our space and three women tumbled out, beaming at us and asking about our park. "We're from the CRA," they told the police, who told them to get back in their car and move along because they were blocking (hypothetical) traffic. I explained to the police that people knew to look for us here because of the Park(ing) Day map distributed online, trying to emphasize, again, that we were part of a larger event. we got out of the street. We schlepped all of our many accoutrements down to a corner that the officers had decided it would be okay for us to use, though the shade canopy was out of the question on a sidewalk. After calming down for a bit, we moved across Wilshire to a shady area and re-set up our park. Passersby commiserated with our situation, and eventually the day went on like it was supposed to. Bobby called the office of Ed Reyes, the councilperson for District 1, and someone there spoke with the police superviser who had kicked us out of the street. The superviser told the council office staffer that we could set up in a space on Park View, directly contradicting what they had told us earlier in the street. As we'd already spent another 30-45 minutes re-setting up our space, we decided to stay where we were. I left for a few hours to visit other parks, and found a lot of astroturf and happy people, but no similar stories of police harrassment. I guess MacArthur Park just isn't allowed to have something that many other parts of LA welcome. At least Allison was able to collect many bike route suggestions from people who stopped at the park. City of Lights organizer Andy Rodriguez speaks with a passerby on Friday. Photo by Allison Mannos. 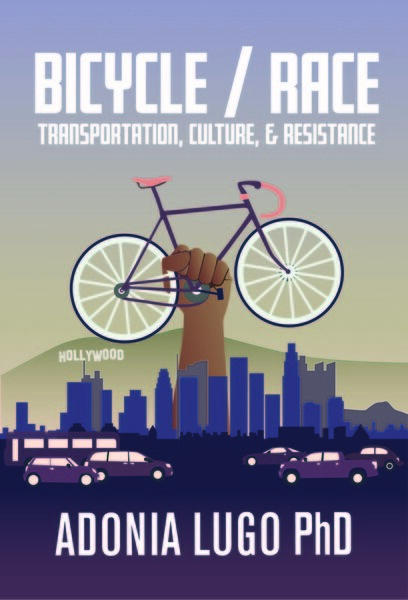 Here's Allison's entry about the day on the LACBC blog. Sadly we were too caught up dealing with the police to take pictures of our first park on Wilshire. A photo of us also got posted on LA Streetsblog. I've been reading a lot of interpretations of Bourdieu and Merleau-Ponty this week, so I understand that the officers are just unable to see possibilities outside of their own daily routines, but man, is it ever disheartening to struggle for change in LA sometimes!